Valerie Nethery's LilyEmme Jewelry is among the first artisanal stores to be featured on Handmade, Amazon's new marketplace. Amazon is firing yet another shot at a competitor. This time it&apos;s a mega-artisanal shot, at Etsy — the popular craft site. The e-commerce giant on Thursday launched Handmade, a new marketplace for, well, handmade goods. This could be wonderful news for the artisan movement, or terrible news for Etsy, its staunchest supporter to date. Valerie Nethery got a message out of the blue, from Amazon. "They emailed me directly. I&apos;m not sure how they found me." She&apos;s runs a little shop called LilyEmme, and guesses "maybe they found my Instagram, or maybe word of mouth." Or maybe through her page on Etsy. Nethery sells 14-karat gold jewelry that&apos;s handmade and ethical, using eco-friendly stones such as moissanite and ethically sourced conflict-free diamonds. 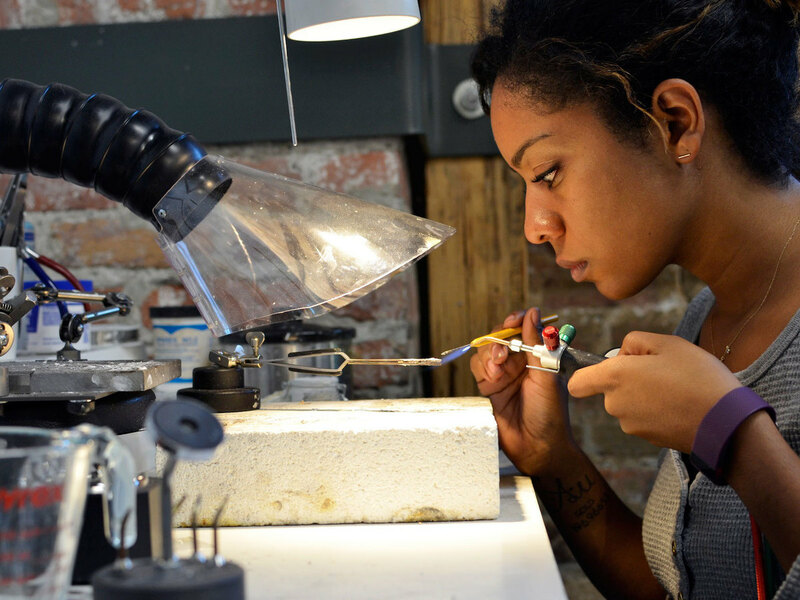 She&apos;s sold enough on Etsy (and through her own advertising) to make this her full-time job. And like many small-business owners, she wants to grow. So she couldn&apos;t ignore that email. "Well, it&apos;s Amazon," she says. "It&apos;s such a big company. I really am passionate about what I do, so — I wanted to be at the forefront of something that I knew was going to be really big." Amazon Handmade went live Thursday and Nethery was among the first artisans showcased on it. She says so far, she hasn&apos;t seen a flood of orders but a few inquiries asking how quickly LilyEmme can get items out and what options are available for custom orders. Amazon is giving artisans a very seductive offer: a chance to reach more than 240 million Amazon customers globally. The store debuts with about 80,000 items from 5,000 sellers. Amazon&apos;s definition of definition of handmade is quite strict. Items have to be completely factory-free — no help at all from manufacturers or a kit. Etsy, the incumbent, lets its artisans use that extra help to scale up. Vanessa Haim, a business owner who sells on Etsy, says it&apos;s unclear which business will woo and retain more sellers — and buyers — over time. She asks, "Well, are people going to now just want to go to Amazon for these kind of products?" Etsy went public in April and is under pressure from investors to grow. This move by Amazon could cut into Etsy&apos;s bottom line. Or, Haim says optimistically, the money Amazon pumps into marketing could make the pie bigger for the handmade industry — bringing in customers who didn&apos;t know to look before. "Maybe instead of, you know, buying this product new, I can get this maybe handmade," she says. Etsy says in a statement that it has spent a decade learning how to support artisans and sellers in a way that "no other marketplace can."